WAIT! – That’s not it ! You can stream live videos from not only one but four webcams over WiFi, 3G or EDGE. It works with both stand alone webcams and the ones that are built into different notebook PC’s. The way this app works is very simple. You download a source called iCam Source on your computer, which is free from the developer’s website. The file will run on both Mac and Windows. After the download, a setup screen will appear with numerous options. Just select your camera and create a unique ID and password and you are done! Open the iCam app on your iPhone, enter the password to see your webcam working perfectly on your iPhone! 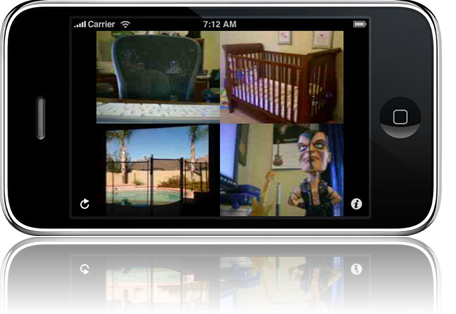 The iCam can be used as a baby monitor, security cam, pet cam, nanny cam or a spy cam. The screen is split into four parts-each can be connected to a webcam. A single tap can open a single screen wide as well. You can save screenshots in your iPhone’s Photos camera roll by pressing the iPhone’s Home and Sleep/wake buttons simultaneously. The Auto-Lock Override doesn’t let your device dim its screen and go to "sleep" after a period of inactivity if the iCam is running. The Auto-Zoom feature lets iCam to automatically zoom in when connected to a single iCam Source. iCam also supports Push Notification feature. This will allow the app to notify you as soon as any of the cameras sense motion in its field. very nice, could you use this as a video chat option?